Looking for the lightest, smallest, and smartest water heater on the market? Look no further. IWG’s new T-Series Tankless Water Heater is the latest product to add to the IWG’s existing family of legacy water heaters. The T-Series heaters have been added to IWG product line to meet higher customer requirements, include features like smarter controls – making them more robust, and allow for water temperature to be accurately controlled. In addition, these heaters are uniquely engineered to meet the requirements for the new generation of VIP aircraft such as the Boeing 787 and A350. Weighing less than 20 lbs, the T-Series can be installed in lavatories, galleys, and VIP showers, providing an endless supply of hot water – reaching a maximum temperature of 145°F. Significant features of the T-Series heater includes complete DO-160G suite qualification, side, top, or combo water inlet/outlet, RS-485 communication, and discrete I/O for status monitoring. The T-Series Water Heaters are also supported by IWG’s on-time delivery, excellent repair turnaround, and premium customer service. 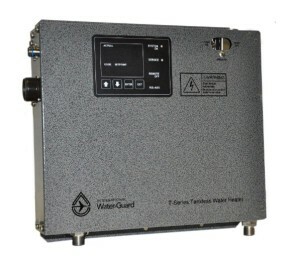 View the IWG-T-Series Unit. Contact us directly to learn more.